This came as quite a coincidence because, as I received The Skull for review, I’d recently started reading a collection of Robert Bloch stories. Bloch is, of course, best known for writing Psycho, the book upon which Alfred Hitchcock’s film was based. Some people may also have heard of Yours Truly, Jack the Ripper – also well worth a read. However, he was a prolific writer of horror and suspense short stories. Amicus films utilised many of these for their portmanteau projects, such as Asylum and The Torture Garden. The Skull is based on Bloch’s The Skull of the Marquis de Sade. This was another short story and, even when scripted for a full feature-length movie, came up short – time-wise. Accomplished director, Freddie Francis – who had also worked with Hammer Films – had to be inventive. Some might consider it blatant padding, but Francis filmed long sequences in Maitland’s study, panning around macabre collectibles and showing Cushing’s character sitting motionless, engrossed in a book. Immensely boring, you may think, but it actually works quite well in building suspense. In fact, Francis creates a very fine movie, considering the plot consists of a skull influencing people to be killed. The Marquis de Sade was a real person – a philosopher and writer who gained an unwholesome reputation as the epitome of evil. This mainly materialised through his writings which depicted scenes of sickening blood, gore, torture, debauchery and generally gruesome goings on. This was shocking, to say the least, in his day but, compared with novels and films of the 1970s and 1980s and beyond, is not especially outrageous – at least in terms of fiction. There are increasing attempts in contemporary works to induce fear coupled with revulsion, but in his day it was positively shied away from as being utterly distasteful. However, de Sade was also considered a pervert, poisoned a prostitute and ultimately ended-up in an insane asylum. It was undoubtedly for good reason, although only a hundred years ago you could practically be committed for forgetting where you’d left your hat. In Robert Bloch’s short story there is a flashback to de Sade torturing people in his dungeon. As Amicus wouldn’t have got this past the censors, it is replaced by a new dream sequence wherein Maitland is kidnapped and brought before a fake judge who forces him to play Russian Roulette. This for me is one of the strongest scenes, and includes his being trapped in a corridor with the walls closing in and thick smoke pouring in through the vents. Peter Cushing is very powerful in his portrayal of Maitland, and Christopher Lee is also stern and convincing as a benign fellow collector. I had to smile at the exchange involving their discussion of the skull over a gentlemanly game of snooker. They must be the two worst players I’ve ever seen, and Lee’s character has the gall to put up his score when no balls have been potted. Patrick Wymark is also very good as the seedy and unscrupulous agent who sells Maitland his collectors pieces. There are two interviews on the disc; both aficionados of the horror world. One is with Jonathan Rigby, the other with Kim Newman, writer and probably the most entertaining critic after Mark Kermode. 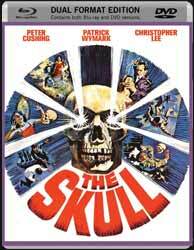 If you like Hammer and Amicus, you need this in your collection.